View More In Business Envelopes. --- No moisture needed to seal, simply raise the lower flap and press. Unique double-flap design keeps the gum from sticking before use. Double flap keeps contents secure. 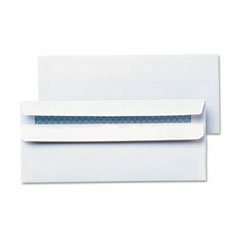 Envelope Size: 4 1/8 x 9 1/2; Envelope/Mailer Type: Business/Trade; Closure: Self-Adhesive.